Wouldn’t we do the same if we had the money? Of course we would. The thing is, all these dictators are just distorting the real-estate prices. Bongo’s “pied a terre”, as the French call a second home, is a 14-bedroom property measuring 48,000-square-feet on an acre of land on the upmarket rue de l’Université. There is, of course, a heated swimming pool, a private jacuzzi, seven parking spaces and a tennis court. The Price? Oh, quite a bargain. Just 136 million dollars or 85 million British pounds or 100 million Euros. Peanuts, in other words. Well, for him, maybe so but not necessarily for his people, because the average income in Gabon is not even 20 dollars a day. How long would they need to work for to have a house like this? 8 million days or – to make it sound a bit shorter – just 22 000 years. Sometimes, mathematics can make people very angry. 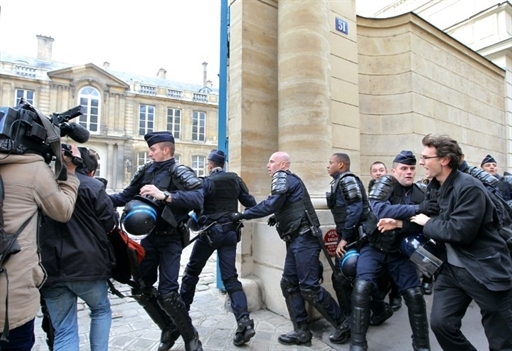 And while French President Nicolas Sarkozy was amicably shaking hands with his Gabonese counterpart at the Elysée Palace yesterday, anti-riot police had to block the entry of Bongo’s private house in Paris. Poor Mr. Bongo, who just made a stopover in Paris on his way in the US, probably couldn’t pay a visit to his new property. What a shame. But at the same time he can count on his friend Sarkozy and the French police. Don't they like black people in this posh neighbourhood? What happened exactly? Do the neighbours of the posh rue de l’Université not appreciate black people? Are they xenophobic? Oh, that’s not the point. Angry people tried to get into Bongo’s house, members of the “Free Gabon collective”, accusing Bongo of amassing a wealth of assets in France through embezzlement, and members of French collective “Jeudi Noir” (“Black Thursday”), who usually squat unoccupied building to protest against real-estate speculation. 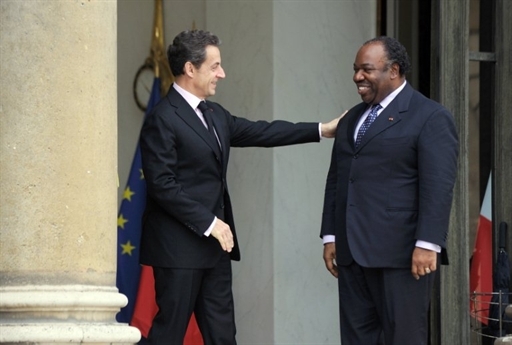 Truth is, after the death of Omar Bongo in June 2009, the people of Gabon got stuck with his son. Bongo remains Bongo. And apparently his son inherited his interest in luxury from his father. Now it’s his turn: Bongo may well continue to increase his personal fortune by looting his country instead of improving the lives of its citizens.